The West of England could get devolved powers worth £1bn and be represented by a single, directly-elected mayor. The announcement of the combined Western Mayoral Authority came in the chancellor's Budget earlier. Under the deal, the new authority would be responsible for decisions currently handled by the Government including transport, skills training and housing. However, final agreement is conditional upon the agreement of all four West of England councils involved. 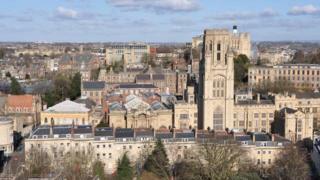 Bath and North East Somerset Council, Bristol City Council, North Somerset Council and South Gloucestershire Council would come under a new "Western Powerhouse" authority. It would receive £30m a year (£900m over 30 years) to boost growth. Additional sums from other sources will take the total above £1bn. A "metro mayor" would oversee the new combined authority. In a joint statement, the councils said the deal could mean "new opportunities for businesses and residents". Bath and North East Somerset Council leader Tim Warren said: "I'm pleased the chancellor has recognised that there is a case in the West of England for a devolution deal to build on the area's very successful local economy." He added that the plan would "allow the region to bring forward some important infrastructure projects". Matthew Riddle, leader of South Gloucestershire Council, believes the deal will provide "real and tangible benefits for residents and businesses". However, other local politicians have criticised the proposal. Bath and North East Somerset Lib Dem councillor Dine Romero described the government's "insistence on imposing an unwanted and unnecessary" directly-elected mayor as "a mockery of its devolution rhetoric". And Bristol Green Party councillor Ani Stafford-Townsend said "true devolution" should be "transparent, democratic and accountable". "So far, the devolution negotiations have been undertaken behind closed doors with no real input from locally-elected councillors or consultation with local people," she added.